Antique German Circa 1800s Glazed Porcelain China Head Dollhouse Doll, incised on the back of her shoulderplate "9 Germany". 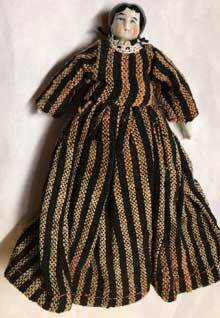 She is dressed in an antique cotton print dress, edged at the neckline with ecru lace . 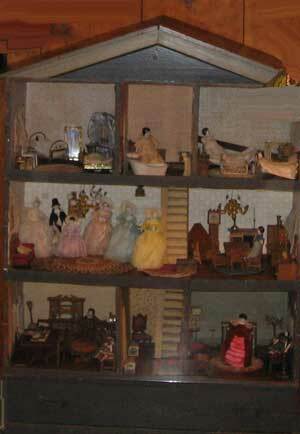 This is a larger dollhouse doll, an approx. 7.5 inches tall, in good condition. She has hand-painted black hair with a center part. A china head shoulderplate with bisque lower legs and arms, cloth body. She has black eyes and wide eyebrows, with blushed cheeks. Under her dress is a half slip and long pantaloons, with lace edging. Brown ankle boots are painted on and there are no chips to her hands. 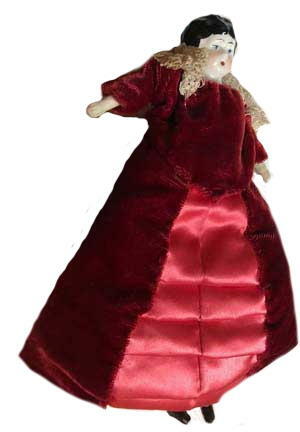 Email Elfie (elfie@dollsville.com) for details of all the Vintage Dollhouse Dolls, Dollhouses and Furniture Collections that are going online.Antique china-head dollhouse doll dressed in an elaborate blue outfit.